“Imagine a day when electrical impulses are a mainstay of medical treatment.” These words, by GlaxoSmithKline’s head of bioelectronics R&D unit Kristoffer Famm, appeared in Nature in 2013, the same year in which the British company launched a $50 million initiative to advance neuromodulation research. Although the phrasing probably sounded farfetched at the time, recent advancements support the revolutionary potential of so-called electroceuticals and shed light on the integral role they are bound to play in the future of medicine. In fact, modulation of nerve signals to control organ function has been increasingly recognized as a powerful, new way to treat a wide range of diseases. The present article will give an overview of ongoing neuromodulation research and discuss the R&D tax credit opportunities available to support companies as they move forward into the era of bioelectronic medicine. The nervous system is key to the control of our physiology. Peripheral nerves connect each and every part of the body to the brain and spinal cord and use patterns of electric impulses, called action potentials, to establish communication between them. This complex network plays a crucial role in the maintenance of physical and mental health. On the one hand, it continuously monitors the body’s health status and responds to disease by adjusting organ function to initiate the healing process. On the other hand, however, it can be the source of pain, metabolic disorders, and autoimmune conditions that are caused by disruptions in nerve signaling. language” and develop advanced implantable devices capable of harnessing the electrical patterns sent out by the nervous system in order to control organ function. The idea is to decipher and modulate neural signaling to trigger the body’s natural ability to heal itself. Bioelectronics aim to provide targeted, personalized treatments that work in a closed-loop; electric activity and associated physiological parameters are recorded and analyzed in real time so that neural signaling can be modulated accordingly. Put simply, bioelectronic devices should be able to constantly monitor patients and automatically adjust treatment to their needs. Though still in its infancy, bioelectronics medicine already inspires ambitious potential applications. Nerve signals can target a virtually unlimited number of conditions, serving a wide variety of purposes, from loosening up airways in asthma patients to reducing inflammation in Crohn’s disease sufferers. Also referred to as neuromodulation therapies, bioelectronics could complement or even replace conventional drugs, creating a new paradigm in which information contained in different patterns of electrical impulses – each one with specific wavelengths and frequencies – become the new therapeutics, specially designed to influence how an organ or system functions. Currently available drug and biologic treatments are often less than ideal as they commonly involve high development costs, variable efficacy, and a wide range of side effects. Despite major advances in the pharmaceutical industry, treatments remain expensive and costs seem to get higher with every new development. According to industry group PhRMA, the average new drug takes a decade and $2.6 billion to reach the market. Emerging bioelectronics could represent a much more economical alternative, since implants have long life spans and could, in theory, be repurposed to treat various conditions. Additional benefits of neuromodulation include a considerable reduction in adverse effects, especially when compared to treatments that saturate the body with extraneous molecules. Also, lack of treatment compliance, such as forgetting to take pills, is not an issue in bioelectronic medicine. In June 2014, The National Institutes of Health launched a $248 million Stimulating Peripheral Activity to Relieve Conditions (SPARC) program, with the objective of advancing the scientific foundation necessary to the development of more effective and minimally invasive neuromodulation therapies. SPARC is organized around four interactive research areas, namely, 1) Anatomical and Functional Mapping of the Innervation of Major Internal Organs; 2) Next Generation Tools and Technologies (to assist in mapping and therapy development efforts); 3) Use of Existing Market-Approved Technology for New Market Indications; and 4) Data Coordination, Mapping, and Modeling Center. Similarly, the Defense Advanced Research Projects Agency (DARPA) launched, in August 2014, the Electrical Prescription (ElectRx) program, aimed at characterizing the anatomy and physiology of specific neural circuits and identifying their roles in health and disease. The $79 million initiative also aims to develop disruptive biological-interface technologies required to monitor biomarkers and peripheral nerve activity, as well as deliver therapeutic signals to peripheral nerve targets. Even though the idea behind bioelectronics is somewhat simple, implementation is supremely complex. One of the first crucial steps is particularly daunting: understanding the fundamental physiology and biological mechanisms involved in the neural control of organ function. In a perhaps oversimplified way, one can say that this task is two-fold. Firstly, there is a need to untangle the body’s complex “wiring”. In other words, researchers need to figure out which neural circuits control which organ functions and develop detailed, predictive circuit maps. This knowledge of the nervous system’s functional relationships is imperative for developing effective, targeted treatment. The second aspect pertains to the particularities of the “electrical conversation”. Researchers must identify the precise patterns and frequencies that affect specific organ functions as well as the changes caused by disease. Many innovative efforts currently focus on drawing a map of neural circuits that can guide future bioelectronic developments. At MIT, for instance, researchers are using a technique known as “expansion microscopy”, which amplifies nervous tissue so that their intricate connections can be observed at a much higher resolution. This is made possible by embedding tissue samples with a polymer that swells when exposed to water. Another groundbreaking method is optogenetics, which utilizes an artificial virus to make neurons sensitive to light and thereby allows researchers to switch them on and off. Menlo Park, California-based Circuit Therapeutics has used this approach to develop technology that excites and inhibit nerve cells. By enabling targeted and immediate control of neural activity, it allows for the identification and characterization of individual nerve cells and circuits involved in normal and pathological conditions. In 2013, Boehringer Ingelheim and Circuit Therapeutics initiated a three-year research collaboration to explore neural pathways in psychiatric disorders. In August 2015, the two companies announced another partnership aimed at investigating the neural circuits involved in obesity as a means to develop new treatments for metabolic diseases. In December of the same year, Circuit Therapeutics was awarded a $2.7 million contract under DARPA’s ElectRx program to fund efforts related to neuropathic pain. In addition to the science gap that needs to be filled, the practical aspects of building reliable, closed-loop neuromodulation devices are also challenging. Even though medical applications of electricity are not new – examples include pacemakers and deep-brain stimulation treatments - bioelectronics is a significantly more complex enterprise. Implants must combine small dimensions, as little as a cubic millimeter, with enough robustness to run powerful microprocessors. Also, they must be made of stable materials that do not transform over time and, most importantly, do not damage delicate nerves. Due to extremely reduced dimensions, traditional choices, such as metal and plastic, are not considered ideal, since they can hurt the human tissue. While possible materials include adhesives and magnets, both GSK and DARPA are betting on a shape-memory polymer that becomes flexible when exposed to heat. The idea is to leverage the sensitivity to high temperatures to shape the implanted devices, making them “hug” the targeted nerves. Another promising alternative is the use of electrically conductive synthetic diamonds, which are sensitive to endogenous chemicals known as neurotransmitters. Researchers at the Mayo Clinic in Rochester, Minnesota are experimenting with this material in the fabrication of deep brain stimulation devices. They aim to build upon the diamond’s ability to measure neurochemicals to create closed-loop systems that are capable to autonomously adjust stimulation frequency and amplitude. If successful, the same principle could be applied to bioelectronic devices. A final and inescapable challenge is security. Bioelectronics connects patients’ nervous systems to a network of computers that act as remote controls to their bodies. In this scenario, the possibility of malignant hacking becomes a major threat. R&D efforts focused on overcoming potential vulnerabilities are key to a widespread adoption of neuromodulation technology. In August 2013, GSK launched a $50 million strategic venture capital fund with the objective of having its first bioelectronics product ready for approval in the following decade. Since then, the British drugmaker has funded over 80 external researchers and started a competition with $6 million available to fund teams working on implants. Bioelectronic medicine represents a major opportunity for GSK and other pharmaceutical companies that must face an increasingly aggressive market when long and expensive trials are not always successful and existing products are bound to face generic competition at some point. GSK’s innovative move towards bioelectronics questions the traditional divide between drug companies and medical device companies and shed light on a promising way forward for the pharma industry. According to Bloomberg Businessweek, GSK plans to begin human trials of neuromodulation therapies for three major chronic diseases in 2017. While these initial tests will use third-party devices, the company aims to have its first implant produced by 2019. On August 1st, 2016 Google and GSK announced the creation of a new bioelectronics joint venture called Galvani Bioelectronics. GSK teamed up with Google’s holding company, Alphabet Verily Life Sciences, to create the new joint venture. The company was named after the late Luigi Aloisio Galvani, the 18th century Italian pioneer of research into electricity. The goal is to create and commercialize bioelectronic medicines through miniature implants that correct electrical signaling along nerves . Galvani Bioelectronics will be based in Stevenage, in the United Kingdom, where GSK’s main research center resides. The company will begin by establishing clinical proofs of principle in inflammatory, metabolic, and hormonal disorders (including type 2 diabetes), while simultaneously developing miniature implants for use in patients. Researchers aim to intervene outside the brain and spinal cord in the peripheral nervous system (PNS). The PNS plays a role in many chronic diseases such as asthma, arthritis, and diabetes. It is also responsible for influencing the performance of organs. It is possible that peripheral nerve stimulation can help treat brain disease by reducing the overproduction of inflammatory molecules. Over a course of seven years, GSK and Alphabet plan to invest £540 million (which equals over 720 million U.S. dollars). Galvani is expected to begin clinical trials on bioelectronic medicines in the next twelve to eighteen months, aiming to be on the market within ten years. Theoretically, bioelectronics can be applied to the treatment of a virtually unlimited number of conditions. Ongoing research supports this claim, as does the fast-paced growth in experimental devices and targeted illnesses. The following sections present some exciting examples. Founded in 2007, SetPoint Medical is devoted to creating bioelectronics to treat inflammatory autoimmune diseases, such as rheumatoid arthritis and Crohn’s Disease. The Valencia, California-based company aims to supplement the body’s Inflammatory Reflex, a natural mechanism through which the nervous system regulates the immune system. Their objective is to use nerve stimulation to activate this natural pathway, generating a systemic anti-inflammatory effect. 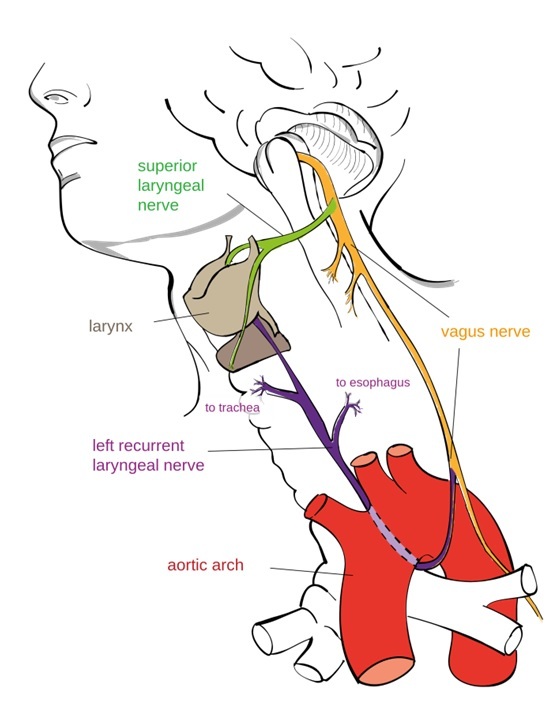 This groundbreaking work pointed to the possibility of treating different conditions by stimulating the vagus nerve, which is responsible for conducting impulses to every major organ in the body. Ultimately, they believed that the delivery of specific amounts of electricity at precise intervals to the nervous system could not only reproduce traditional therapies, but eventually represent cheaper, more effective treatments alternatives with fewer risks. It was the birth of the bioelectronics field. Building upon this knowledge, SetPoint developed an implantable miniature neuromodulation device that works as a built-in therapy for inflammatory autoimmune diseases. Paired with a wireless charger and iPad control application, the innovative pulse generator is intended to provide lower cost and improved safety as compared to drug treatments. The innovative microregulator is intended to last 10 years thus freeing patients from repeated injections and pills. In November 2012, SetPoint completed a first-in-human open-label proof-of-concept trial in rheumatoid arthritis patients, which validated neuromodulation as a potentially revolutionary therapy for autoimmune inflammatory diseases. In December 2014, the company launched a clinical testing to assess the safety and efficacy of its bioelectronic therapy to treat Crohn’s Disease. The ongoing study is being conducted at five different centers around the globe. In September 2015, SetPoint raised $15 million to further advance its anti-inflammatory, neuromodulation platform. Besides GSK, the list of investors included Covidien Ventures, Boston Scientific, Morgenthaler Ventures, Foundation Medical Partners, and Topspin Partners. Minneapolis, Minnesota-based CVRx is the creator of the Barostim Therapy for heart failure and resistant hypertension. The groundbreaking treatment uses patented technology to electrically activate the Baroreflex, which is the physiological mechanism that regulates cardiovascular function. The activation of this natural pathway reduces sympathetic activity and increases parasympathetic activity thus restoring the body’s autonomic balance. In 2015, CVRx presented positive results from a randomized study in which, after six months of Barostim Therapy, patient symptoms, functional capacity, and cardiovascular function were significantly improved, while heart failure hospitalization days were reduced. The company’s Barostim Neo, a minimally-invasive, implantable neuromodulator, is commercially available in over 20 countries and under clinical evaluation in the U.S. CVRx recently raised $46 million, bringing its total equity funding to $237 million, as of June 2016. Research has revealed that the bioelectrical communication among cells plays a key role in the body’s growth and development. This leads to believe that changes in the cells’ existing electronic signals can generate new patterns of growth, a possibility with potentially revolutionary impacts for cancer patients. Aiming to verify this assumption, researchers at Tufts University recently used light to manipulate bioelectric signals from cancer cells in frogs. Their success suggests that optogenetics can in fact help disrupt the electrical communication between cancerous cells and healthy ones, potentially preventing the appearance of new tumors and even causing the regression of existing ones. Characterizing the specific electrical signals associated with tumor growth can revolutionize cancer treatment and prevention, allowing for the identification of risks even before tumors start to grow and ultimately altering the course of the disease. According to the latest data from Centers for Disease Control and Prevention, 4.3 million American adults suffer from epilepsy, a disorder of the brain that causes seizures. Conventional anti-seizure medication and devices deliver constant therapy, not considering whether the patient is actually having a seizure or not. This approach has proven to have chronic side effects with significant, negative impacts. Aiming to improve the life of epilepsy patients, Mountain View, California-based NeuroPace developed the RNS System, an implantable device designed to prevent seizures at their source. The innovative solution monitors, detects, and responds to the brain signals that cause seizures and are thus automatically activated only when needed. Each device is tailored to recognize the patient’s specific electrical patterns so that it can rapidly identify and disrupt abnormal activity before it leads to seizure symptoms. In theory, bionic limbs should work just as real ones. They should operate on signals sent by the brain, nerves, and muscles; doing exactly what the patient wants it to. However, current technology, which traditionally relies on electrodes placed on the patient’s skin, has encountered some challenges when it comes to reliably processing the body’s electrical signals over extended periods of time. Researchers at Purdue University Center for Implantable Devices are using bioelectronics to overcome these challenges. They have developed small, internal electrodes that can be placed inside the amputee’s remaining muscles. The innovative electrodes are capable of reading nerve signals more clearly than traditional ones and can therefore improve the performance of artificial limbs. Purdue’s groundbreaking technology was recently licensed by Coapt, a provider of intuitive control systems for advanced prosthetic arms. The Chicago, Illinois-based startup describes the technology as “game-changer” and expects it to give amputees unprecedented freedom of movement. Yet another exciting application of bioelectronics is overcoming paralysis. Researchers at the Feinstein Institute have recently unveiled an innovative “neural bypass” system, which consists of an implantable device located in the brain that records electrical signals generated when patients try to move their paralyzed limbs. 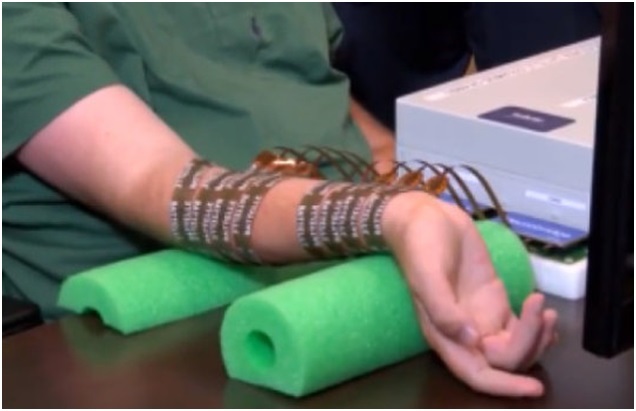 After being decoded by a computer, the signals are sent out to an electronic sleeve (in the case of paralyzed hands or arms), which stimulates the muscles, jolting them into action. In the study, published in May 2016, a patient with quadriplegia from a spinal injury was able to perform functional tasks relevant to daily living, which involved grasping, manipulating, and releasing objects. The experiment utilized a neural bypass with 96 electrodes that measured brain cell activity 30 thousand times per second. A machine-learning algorithm was used to process the massive amount of data recorded in order to identify which specific patterns corresponded to which intended movement. Based on this information, the system reproduced the electrical pulses that were passed on to the muscles via 130 electrodes located on top of the participant’s skin. Researchers are currently invested on making this revolutionary technology work wirelessly. However, the amount of information collected in the brain – about 1 gigabyte every three minutes – poses an obstacle. Future developments may also include using implanted electrodes for muscle stimulation. Obesity is undoubtedly one of the most pressing global health problems, which affects more than one-third of American adults. Associated with various co-morbidities, such as heart disease, stroke, type 2 diabetes, and certain types of cancer, obesity greatly increases the risk of preventable death. Despite the magnitude of the problem, existing solutions are flawed and often accompanied by significant side effects. Aiming to offer a better alternative for those suffering from gastrointestinal and metabolic diseases, Saint Paul, Minnesota-based EnteroMedics has created the vBloc Therapy. Delivered by an implantable device called Maestro, the innovative bioelectronic system controls the neural signaling between the brain and the digestive system thereby regulating the sensations of hunger and fullness. In a study published in April 2016, EnteroMedics registered a 74 percent greater weight loss in moderately obese patients using vBloc when compared to a control group. The neuroblocking treatment resulted in an average loss of 33 percent of excess weight over 12 months. Ongoing research has pointed to the possibility of using vagus nerve modulation to treat other digestive diseases. In the case of diabetes, for instance, preliminary research has supported the idea that bioelectronics may be able to regulate the production and cellular response to insulin. Experimental studies have also pointed to the possibility of mitigating symptoms of ulcerative colitis through vagus nerve stimulation. In September 2015, researchers at the University of Pittsburgh successfully reduced symptoms of overactive bladder by sending electrical signals through electrodes placed on the soles of patients’ feet. The improvements were more significant than those provided by conventional medication and were not accompanied by common side effects of standard drugs, such as constipation, dry mouth, etc. The University was recently awarded a four-year, $10 million U.S. Department of Defense contract to develop an implantable neuromodulation device designed to restore bladder control in spinal cord injury patients. The connection between the brain and the nerves that tense or relax the urinary sphincter and contract the bladder is lost after this kind of injury. However, since the nerves remain intact, bioelectronics can theoretically be used to replicate normal bladder functioning. San Jose, California-based life sciences R&D company InCube Labs will contribute to these efforts, which can improve the lives of more than 275 thousand Americans who live with spinal cord injuries. The challenge is considerable, since there is a need to regain control over both the bladder and sphincter while restoring the timing between them. Bioelectronics research points to a future in which people afflicted by disease will not have to take pills and be exposed to their side effects. Instead, by leveraging our existing nerve circuits, technology will enable the body to heal itself. The many advances reported in this article are just a glimpse into the revolutionary potential of electroceuticals. R&D tax credits are available to support innovative companies dedicated to overcoming outstanding challenges and realizing the extraordinary potential of neuromodulation therapies.